Beer arrived in Hong Kong even before Hong Kong became British. In the months before the opening of the First Opium War in late 1839, a fleet of British merchant ships lay anchored off Hong Kong island, there as part of the manouverings and squabblings between London and Beijing over the continuing import by the British of opium from India into China. The fleet was supplied in September that year with ‘good beer’, along with selzer water, ‘moderately good French claret’, bread, pigs and poultry, all sent from Manila 700 miles away to the south: (1) not the last time Manila, Hong Kong and beer would be linked. The British Chief Superintendant of Trade in China, Captain Charles Elliot, effectively London’s representa- tive in the region, was with the merchant fleet, trying to negotiate with the Chinese over the opium question. He paid Lin’s family 1,500 silver dollars, put up $200 as a reward for evidence leading to the murderer’s convic- tion, and handed out $500 in general bribes to the locals. Elliot also held a court of inquiry into Lin’s death on board one of the ships off Hong Kong. Five sailors were tried for the affray and found guilty of riot, but on the evidence as presented, no murderer could be identified. The British sailors blamed the Americans, who, they said, had drunk more of the san shao. Lin Zexu’s orders resulted in several skirmishes between British ships and the Chinese fleet in which a number of junks were sunk. The rumbling argument broke out into an official declaration of war in London early the following year, in large part to secure com- pensation for the opium destroyed by Lin, with 4,000 marines and four steam-powered gunboats sent to the Pearl River delta from Singapore. As part of the subse- quent fighting, Elliot, apparently deciding that the Portuguese in Macau could not be trusted and Britain needed its own territorial base in China, seized Hong Kong island in the name of Queen Victoria. This de facto land-grab became de jure in August 1842 with the signing of the Treaty of Nanking that ended the First Opium War and handed Hong Kong officially to Britain. When we were, in the middle of the summer, able to purchase porter or beer from the merchants in the town, we had in the canteen a large ice box, and we kept ginger beer and similar draughts, and the soldiers drank a great deal of iced ginger beer with porter or ale mixed with it, and at that time there was very little drunkenness among the men … As long as good and cheap porter remained at the canteen the men always drank there and not in the town. [Sankey also told the committee that] acting on the advice of some of the old medical practitioners in Hong Kong [the men were given at night] a tumbler of beer and some cheese; and we considered that had a very beneficial effect on their health … because at night, when the miasma and damp arises, if a man’s stomach is full he will not suffer so much as he would do otherwise. Figure 1. China Mail, 2 March 1868, p.1 – Allsopp/Barclay Guinness. The colony was importing 7,609 barrels of beer from Britain in 1875, worth £29,684. (15) Brewers from the United Kingdom continued to dominate Hong Kong’s beer trade through to the end of the 19th century – between October 1896 and September 1897, England and Scotland exported 7,686 barrels of beer to Hong Kong, worth £21,424, more than went to either New Zealand (5,076 barrels) or Canada (3,656 barrels). 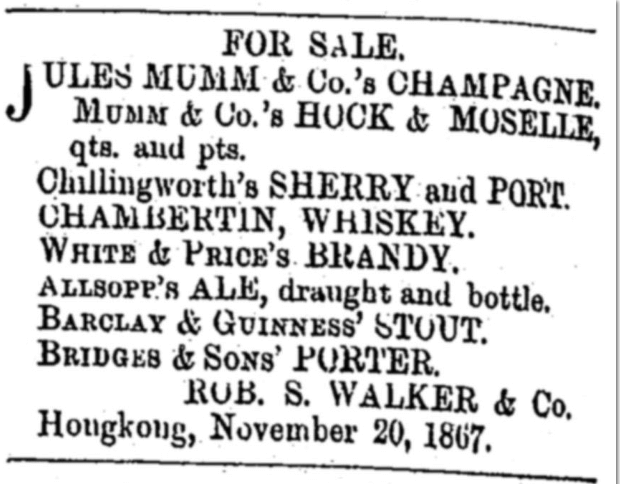 The end of the 19th century, however, seems to have witnessed a complete change in Hong Kong’s tastes, with British ales and stouts being replaced by lagers from other lands. As early as May 1876 Lane, Crawford was advertising Danish beer from the Tuborgs Fabrikker’, Tuborg then being just three years old. Right underneath that ad in the China Mail was another declaring that the Tudor Ice Company would be retailing its ‘natural ice’ at one cent per pound: at least the Tuborg could be drunk cold. (16) In 1886, beer from the Brauerei Zur Eiche in Kiel, North Germany was being advertised for sale in the colony. (17) By 1896 the Seattle Brewing and Malting Co. had opened an agency for China and Japan in D’Agulier Street, Hong Kong, and was selling ‘Braun’s “Export” Beer’. (18) Lager beer from the Anheuser-Busch Brewing Association (brand unstated), presumably imported all the way from St Louis, was on sale in Hong Kong in 1899. (19) Two years later, in 1901, Hongkongers were being offered Kirin from Japan, ‘a delicate lager’, in quarts and pints, and El Capitan ‘Pilsener beer’ from the Pacific brewery in Tacoma, Washington, (20) as well as two more West Coast beers, Weinhard’s from Portland, Oregon, and Rainier’s brewery in Seattle, Washington. (21) In 1905 the China Mail carried an ad for ‘Prinz Ludwig light Pilsener beer’, and by 1906 Augustiner Brau and Kulmbacher Bier from Germany were available in the colony. (22) Meanwhile, by 1900, advertisements for British beers virtually disappear from Hong Kong’s English-language newspapers. Gradually entrepreneurs around the region were starting breweries to compete with imports from America and Europe. In 1891 Enrique Barretto, ‘an old and wealthy resident’, opened La Fabrica de Cerveza de San Miguel in the district of the same name in Manila, the first in the Philippines. The new San Miguel brewery was using brewing and refrigeration equipment from London, but making beer ‘after the German system’, specifically ‘Culmbacher’ beer to begin with. (23) The malt for the San Miguel brewery came from San Francisco via Hong Kong every 10 days, ‘which will insure its being fresh’. Figure 2. China Mail, 2 March 1868, p.1 – Lane, Crawford. That ‘estimated’ output was equal to 7,500 barrels a week, or 390,000 a year, a wildly unlikely figure for a start-up in Hong Kong when the entire population, Chinese and European, only stood at around 284,000, and no more seems to be known of Mr Von Moslowsky. Indeed, he looks to be a figment of the Straits Times’s imagination. The concern the China Mail (26) had heard rumours about appears to have been the Hongkong Brewery Company Ltd., which held its first shareholders’ meeting at 15 Queen’s Road, Central on 15 February 1904. The shareholders were told that the company intended to erect a brewery alongside the Metropole Hotel, on the then Shaukiwan Road (now King’s Road) at North Point, some three miles east of what was then Hong King proper, and by what was then the seashore (land recla- mation means that today’s shoreline is some 250 yards further north). The company’s chairman, Mr E.A. Meurer, said the land for the brewery had been bought from Sir Paul Chater, a leading Hong Kong business- man, for $30,000 (that is, British trade dollars, the currency circulating in Hong Kong at the time, which were worth around two shillings each) along with the Metropole Hotel itself, which cost a further $50,000. The site was ‘practically the bed of a watercourse’, which Sir Paul had agreed to divert at his own cost, building a nullah, the Hong Kong term (from Indian English) for a concrete-lined canal, to carry away the water. samples of this water have been submitted to analyses, and have been pronounced to be suitable for the purposes of brewing good beer. Of this water, the company has an abundance for all its purposes, and beyond the expense of laying down pipes to convey it into our brewing vats and tanks it will cost us nothing. There was also a reservoir at the side of the property and a little higher up, from which the company could draw as much water as would flow through a two-inch pipe, ‘so that we are absolutely safe from a water point of view, even if our brewery develops in time into a very large concern’. The company was leasing the Metropole Hotel to a hotelier who had agreed to sell the Hongkong Brewery Company’s draught and bottled beers, Meurer said, and he expected ‘an ample market locally for all the beer we propose to build at first’. But ‘what we need now is money. We want the rest of our shares taken up before we can put up our brewery and commence brewing’. Hoe, S and Roebuck, D. (1999) The Taking of Hong Kong: Charles and Clara Elliot in China Waters. Richmond: Curzon Press. p.95. The New World. (ed. by Benjamin, P.) 18 December 1841, Vol. 3, p.389. Hanes, W.T. and Sanello, F. (2002) The Opium Wars: The Addiction of One Empire and the Corruption of Another. Illinois: Sourcebooks. pp.61-63. Hoe, S and Roebuck, D. (1999) op. cit. p.85. Waley, A. (1968) The Opium War Through Chinese Eyes. Redwood City: Stanford University Press. footnote p.57. Fry, P.W. (1998) The Opium War 1840-43. Chapel Hill: University of North Carolina Press. pp.324-5. Ordinances of Hongkong 1844-65, Hong Kong. (1866) Hong Kong: Legislative Council. p.19. Pfeiffer, I. (1850) Eine Frauenfahrt um die Welt (A Woman’s Voyage round the World).London: Williams and Norgate. p.205. Annual Statement of the Trade of the United Kingdom with Foreign Countries. (1856) HM Stationery Office. p.307 and McCulloch, J.R. (1871) A dictionary, practical, theoretical, and historical, of commerce and commercial navigation. London: Longmans Green. p.703. China Mail. 2 March 1868. p.1. 1 Hongkong Daily Press. 28 November 1867. p.1. China Mail. 10 August 1869. p.1. Hunt, R. (ed.) (1878) Dictionary of Arts, Manufactures and Mines. London: Longmans, Green & Co. p.99. China Mail. 27 May 1876. p.1. Hong Kong Daily Press. 25 November 1886. p.8. Hong Kong Telegraph. 10 February 1896. p.1. China Mail. 25 November 1899. p.1. China Mail. 11 March 1901. p.1. China Mail. 1 May 1901. pp.4-5. China Mail. 19 July 1906. p.1. Reports from the Consuls of the United States, United States Bureau of Foreign Commerce. (1890) US Government Printing Office. p.448. Straits Times. 3 July 1900. p.2. China Mail. 21 August 1903. p.4. Hongkong Telegraph. 17 February 1904. p.4. This article was first posted on 15th August 2015.